Ancient Balinese history was not uppermost in Ida Rsi Bhujannga’s life until plans to build a septic tank at his home turned into an archeological discovery that has scientists bewitched. The elderly high priest says he is now fascinated by his community’s history, which the rare find of dozens of massive stones has uncovered. These meter-long stones are believed to be from a 14th century temple complex that may have been the largest ever constructed on the Island of the Gods. “I have become very interested in archeology since this was found, because we must know our history here in Bali. As a priest I need to know about this history so I can teach people,” said Bhujannga. He is speaking of ruins of a Hindu temple unearthed recently during excavations into rice fields to extend his home in Penatih village, Denpasar. 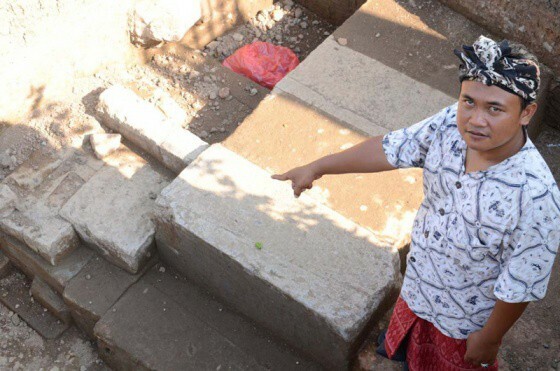 Workers struck the huge mudstone foundations of the temple at just 70 centimeters below the surface, and in doing so have altered the Denpasar history books.